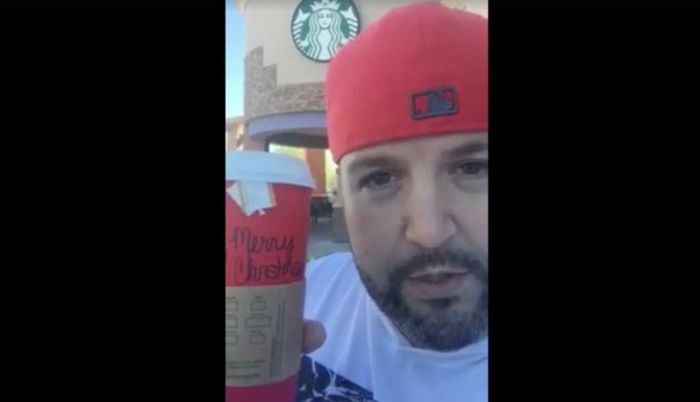 Joshua Feuerstein's Facebook post about Starbucks removing Christmas themes from its cups went viral in 2015 and now he's claiming that the coffee chain offered him a substantial amount of money for the rights to his video so they could remove it from the internet. "Starbucks actually approached me and offered me a ridiculous amount of money to purchase the rights to my video because they wanted it removed," Feuerstein told Faithwire last week. "They wanted it gone." The Christian Post contacted Starbucks for comment to Feuerstein's claims but a response is still pending. The coffee chain ruffled feathers in 2015 with the debut of its holiday cup design: a nondescript red cup adorned only with the Starbucks logo — a look that many evangelicals, including Feuerstein, felt had ignored the Christian holiday. Starbucks' cup design garnered negative responses from many Christian customers after Feuerstein, a preacher and former TV and radio evangelist, shared his opinion on the matter in a Facebook video to his 1.8 million followers. He said in 2015 that Starbucks was deliberately attacking Christianity and the birth of Jesus by its lack of Christmastime cup décor. Celebrities such as Ellen DeGeneres, Candace Cameron Bure and others chimed in on the controversy and brought even more attention to the debate. Starbucks announced on Thursday that its 2018 cups will feature winter and holiday themed designs instead of only having a solid red cup. Roz Brewer, chief operating officer for Starbucks, said in a statement that the new patterns came as a result of feedback from customers who said they "loved the tradition of Christmas." Before the 2015 debacle, the Seattle-based company had been releasing Christmas themed cups since 1997. Feuerstein believes the attention he brought to Starbucks is what "woke corporations, advertisers up to the fact that consumers want a values-based culture, including media, entertainment, products." He also praised President Trump for bringing more attention to the actions of retail stores and other businesses that were omitting "merry Christmas" from signs and barring staff from acknowledging the holy season when greeting customers. Feuerstein contends that Trump telling supporters during the 2016 presidential campaign that, if elected, "We're gonna start saying 'merry Christmas' again" is most likely what encouraged Starbucks to get back on board. "I would venture to say it was that exact stance that was one of the things that helped to get him elected," he said. "People look at Christmas as an American value, it's a time that we stop to celebrate the birth of Christ." Feuerstein added that the cultural impact of "progressives on the left" also motivated conservative Christians to be more assertive.